For my cooking class this week, I had a menu featuring the best of the season - figs, apples, pears, and pumpkin seeds, all served in salads, grilled pizzas and in rustic fruit tarts. I wanted to share this recipe for tomato jam - a sweet, tart, spicy, tangy savory jam that works well as the base for a pizza, as an hors d'oeuvres or for a chicken or fish dish. It's a relatively straightforward recipe; a little bit of chopping and a few hours of simmering. It's a bit of a set it and sort of forget it recipe. The only special thing you need for this recipe is some patience to wait out the cooking time. The recipe is a "whisper down the lane" recipe - I found it on a blog called Garden of Good Eating. The writer found it from Marissa of "Food in Jar's" cookbook, who in turn found it and took it from a recipe by Mark Bittman. This is the 4th version of it. I added the onions, brown sugar and balsamic vinegar, omitted jalapeños and cumin. The recipe works - no matter what version you use! Update September 2014: I roasted my tomatoes for a few hours, in a very hot oven, until they were completely cooked down. It was a way to use up half a case of plum tomatoes. I cleaned them, cut the tops off, cut them into chunks and then tossed the tomatoes, along with a few chopped onions and a head of smashed garlic clovers, and a bit of olive oil into a 450 degree oven, and roasted the tomatoes until every bit of liquid was reduced. 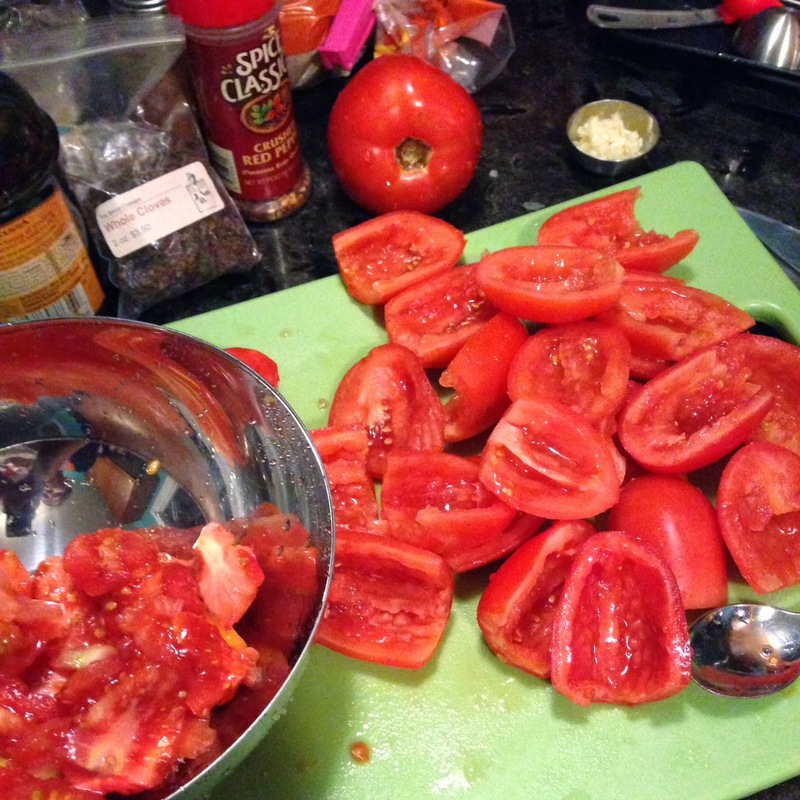 The tomatoes became so concentrated they were sweet and sticky. One batch I turned into tomato paste. Another went into the tomato jam. I did it over 2 nights, as the roasting took close to 4 hours. Proceed with the recipe, sautéing the onions and garlic, adding in the brown sugar, ginger, cloves, red pepper flakes, etc. 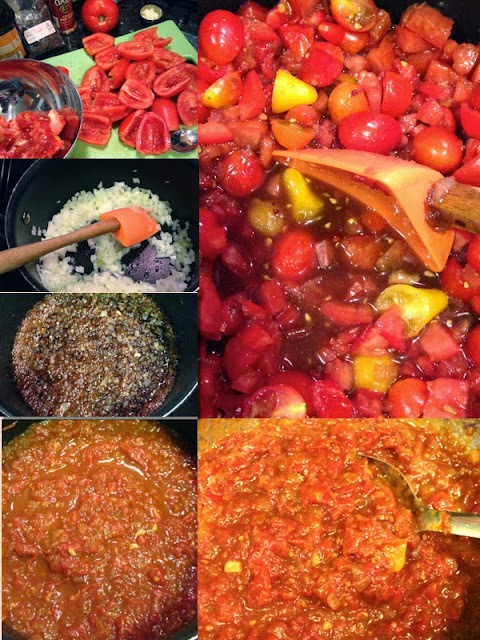 You won't need to cook down the jam nearly as much, since the tomatoes are already cooked down. The point of doing it this way is to create a deeper more complex layer of flavor. Before I finished canning the jars, sealing them with the lids and bands, added a half teaspoon of bottle lemon juice to the small 4 ounce jars and 1 teaspoon of bottled lemon juice to the 8 ounce jars. Seal, tighten the bands and water process for 20 minutes. minutes, until they begin to take on a golden color. Add in the garlic and sauté for another minute. 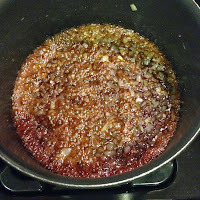 Next, add in the brown sugar and balsamic vinegar and cook until the onions and sugar caramelize - about 10 minutes more. Add in the tomatoes, lime juice, ginger, ground cloves, salt, pepper and red pepper flakes, combining all ingredients in the sauce pot. Bring the mixture to a boil over medium heat, stirring often. 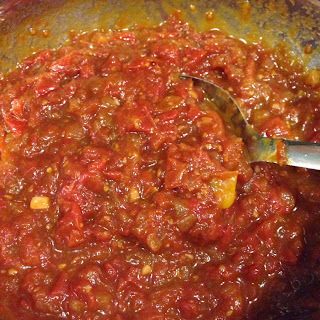 Reduce heat and simmer, stirring occasionally, until mixture has consistency of thick jam. This may take from 1 1/2 hours to 2 hours. Be patient! If the tomatoes are thin-skinned or watery, such as cherry or grape tomatoes, there will be a lot of liquid. Taste and adjust seasoning, then cool and refrigerate until ready to use; this will keep at least a week. Yield: About 1 pint. The jam can be canned. As the jam is cooking down, prepare your pint or half-pint jars and lids - wash, sterilize and start your water bath. Cook the jam down until it's ready - when it's thick and jam-like. Have the jars in the hot water bath, the lids cleaned and hot and the bands cleaned and dried. Ladle the hot tomato jam into hot jars. Leave 1/2 inch head space from the top of the jar. 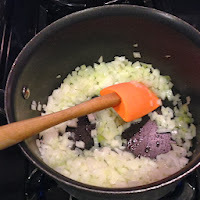 Remove any air bubbles in the jar by placing a non-reactive spatula down the side of the jar. Wipe the jar rim clean. Place the sealing lid, compound side down, onto the jar and screw on the sealing band. Screw shut, finger-tip tight. Add the hot filled jars back to the water bath, and bring the water to a boil, reduce the heat, to a low boil, more than a simmer, and boil the jars for 20 minutes. Remove from the water bath and cool, right side up on a clean, heat safe surface. As the jars cool, the seal will set; you should hear a "pop" sound. Cool 10 hours/up to over-night. Any unsealed jars should be refrigerated and the contents used within 1 week. Sealed, canned jars will hold for up to 1 year. Label, date and store jars in a cool dark area.